The U.S. nuclear blackmail is only a paper tiger. The nuclear arms era started in 1945 was already superseded by directed energy weapons in the 1947s. Today, the U.S. nuclear warheads pose no threats to the North Korean strategists. As revealed back in 2016, this joint Iranian-North Korean directed energy weapon program is already advanced enough to be publicly leaked to outside OSINT analysts. The neutrino-antineutrino annihilation at the Z0 pole counter nuclear weapon can not only destroy preemptively any nuclear warhead wherever it is located on earth, as far as the opposite side of the planet at 12,756 km and beyond. But it can also engage any conventional target as well, static or moving, be it humans, robots, machines, depots, factories, submarines, CVs, bombers, missiles, etc...and at the near speed of light. Unlike the obsolete ballistic missiles, it does not necessarily need to transit through air and space, but its beam of particles can simply follow any geodesic, thus directly penetrating through the earth crust and mantle, making it indefensible. Kamal al-Din (1267–1319) was the most prominent Persian author on optics. His research in this regard was based on theoretical investigations in dioptrics conducted on the so-called Burning Sphere. Galactic Penguin SST, post: 10312828, member: 186587 Wrote: To see the peace-loving North Korean people as warmongers, only shows how brainwashed one is, being exposed to the 24/7/365 hideous enemy's propaganda. Indeed, the great Choson people has always stated that its legitimate and only goal was the right of peaceful coexistence among all nations. As a proof of His goodwill, General Kim Jong Un will not hesitate to contribute to the world denuclearization, if He could in return obtain the withdrawal of all U.S. troops stationed in the Korean peninsula, and lead a reunified Federal Republic of Korea, formula first proposed by Kim Il Sung, another Great Person of the Mt. Paektu. Moreover, Choson's treasured nuclear sword is nothing compared to its next and still top secret superweapon in development, and known only to a few outside of North Korea, as The Relativistic Through-Crust-and-Mantle (classified) particle WMD, unlocked by having mastered thermonuclear fusion technologies. ▲ 2. DPRK Directed Energy Counter Nuclear Weapon Program. Uploaded on December 23, 2018. Hirotaka Sugawara et al. have first proposed in 2003, the use of a high energy neutrino beam to destroy nuclear weapons remotely. This hypothesized neutrino beam passes through the Earth and interacts with the nuclear materials inside of the distant nuclear weapon. This interaction can result in heating the nuclear material melting or damaging components of the device or potentially enabling remote detonation of an armed nuclear device. The neutrino beam makes holding armed nuclear weapons more of a liability than a benefit, as an enemy armed with a neutrino weapon could consider remotely detonating them before they could be launched. Even if the bombs are not assembled, an enemy with a neutrino beam could simply render them useless over time. There is no known method of shielding against these beams. However high energy neutrino beams themselves might be used as weapons. Sugawara also suggests that this technology can be used as a deadly weapon even against enemies that do not possess nuclear weapons. The neutrino beam can be aimed at people or places and the resulting hadron shower can be deadly. The weapon can be effective even against individuals in deep underground bunkers and other seemingly secure locations. ▲ 3. A muon storage ring is used to accelerate larger particles, muons, to high energies. Muon collisions produce high energy neutrino beams that can be controlled and aimed. ▲ 4. 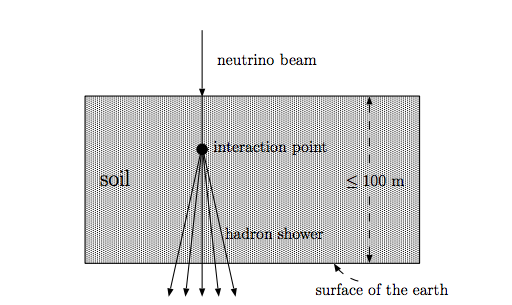 Neutrino beam passes through the Earth and interacts with the nuclear materials inside of the distant nuclear weapon. ▲ 5. The neutrino beam can be aimed at people or places and the resulting hadron shower can be deadly. Then in 2008, Alfred Tang et al. proposed an alternative idea for a neutrino counter nuclear weapon that shares some similarities with the idea presented by Hirotaka Sugawara et al. but is technologically feasible, relatively cheap and safe. Tang's idea was to focus a neutrino beam and an antineutrino beam together in a small region to allow them to annihilate so that high energy radiations are released as reaction products. We discuss the possibility of utilizing the ultra-high energy neutrino beam (about 1000 TeV) to detect and destroy the nuclear bombs wherever they are and whoever possess them. Radiations produced by neutrino-antineutrino annihilation at the Z0 pole can be used to heat up the primary stage of a thermonuclear warhead and can in principle detonate the device remotely. Neutrino-antineutrino annihilation can also be used as a tactical assault weapon to target hideouts that are unreachable by conventional means. Nuclear weapon is the most destructive kind among weapons of mass destruction. Hiroshima and Nagasaki are lessons in history that shall never be repeated. Since the end of World War II, world leaders had tried to control the proliferation of nuclear weapons by political means such as the Nuclear Non-proliferation Treaty in 1968. Many countries did not sign the treaty. In fact it seems that more and more countries are pursuing nuclear weapon programs nowadays. After September 11, the concern is that nuclear weapons will fall into the hands of terrorists. Strategically speaking the importance of a counter nuclear weapon may soon rival that of the nuclear weapon itself. The purpose of this paper is to explore the possibility of a neutrino counter nuclear weapon technology. The idea of using neutrinos to detonate or melt a nuclear weapon was first proposed by H. Sugawara, H. Hagura and T. Sanami . Their futuristic design is based on a 1 PeV neutrino beam operating at 50 GW. It is unlikely that such an intense ultra high energy neutrino beam can be realized in the near future. Even if such a neutrino beam is made available, its radiation hazard will render it politically nonviable. 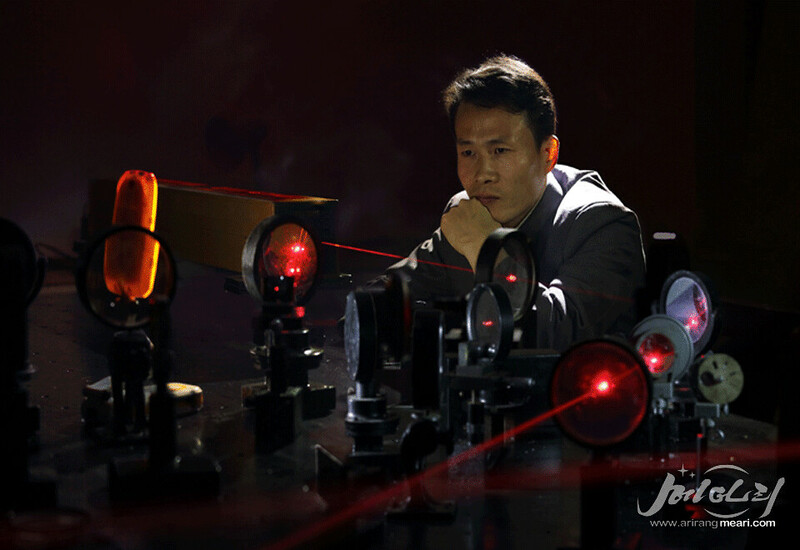 Other proposals such as installing neutron detectors at the border to intercept nuclear materials had been considered. The current trend of non-proliferation policy is focused on monitoring the production of fissile fuels. Research is being conducted to use anti-neutrino detectors to this end . Anti-neutrinos are produced in nuclear fission through beta decay. They are indicators of the fissile fuel composition of the nuclear reactor. Neutrino signatures of the fissile fuels cannot be tampered with by virtue of the very small reaction cross section of neutrinos at low energy. On the other hand, the small reaction probability also means small detection probability so that large detectors are needed to detect them. A sample idea is to deploy hundreds of kilo-ton liquid scintillator detectors at 1000 km distance from the reactor to monitor the reactor anti-neutrino spectrum. The challenges of using anti-neutrino to monitor reactor are that (1) a rogue nation will not voluntarily allow IAEA to build anti-neutrino detectors around its reactors, (2) the number of anti-neutrino detectors must increase 4 folds for every doubling of reactor-detector distance, and (3) reactors are not needed if a rogue nation opts for uranium instead of plutonium bombs. For these reasons, anti-neutrino detectors are probably not the ultimate solution to non-proliferation. Another possible non-proliferation strategy is to develop a technology that counters nuclear weapons. This paper proposes an alternative idea for a neutrino counter nuclear weapon that shares some similarities with the idea presented in Reference  but is technologically feasible, relatively cheap and safe. The present idea is to focus a neutrino beam and an antineutrino beam together in a small region to allow them to annihilate so that high energy radiations are released as reaction products. The radiations cause neutron spallation in the sub-critical nuclear material and initiate fission reactions. The plutonium heats up, ignites the chemical explosive around the fissile (fissionable material) in the primary stage of a thermonuclear warhead and subsequently detonates the nuclear weapon. The reason of thinking about neutrino for this application is that neutrino cannot be shielded. It can hit a target such as a nuclear submarine from the other side of the globe and can penetrate a deep underground concrete bunker and missile silo. Since neutrino can penetrate the planet to reach a nuclear weapon on the other side of the globe near the speed of light, a neutrino counter nuclear weapon is in principle untraceable and indefensible. It is suggested that a neutrino counter nuclear weapon is 100% effective . The trade-off of developing a counter weapon is the introduction of a new weapon. If the new weapon is less destructive than the original weapon, an ethical argument can be made in support of its development. If remote detonation of a nuclear weapon is made possible by a neutrino counter weapon, a nuclear weapon in the homeland becomes a liability so that there is a real strategic incentive to reduce the stockpile. In that case, there will be a much more convincing political reason to promote non-proliferation. This work aims to study the theoretical feasibility of the neutrino counter nuclear weapon as a first step in this direction. The use of neutrino as a tactical assault weapon will also be discussed. As discussed above, the development of powerful enough Laser Wakefield Accelerators (LWA) is critical and at the core of this technology. No need to add that such laser research can not be conducted without a sufficient reserve of rare earth minerals, the sine qua non prerequisite in high energy physics. Indeed, North Korea's 216 million tonne Jongju deposit, theoretically worth trillions of dollars, would more than double the current global known resource of REE oxides which according to the US Geological Survey is pegged at 110 million tonnes. This amounts to five times that of China's, the current world's first rare earth minerals exporter. Making Kim Jong Un's Korea the military powerhouse the most likely to first succeed in developing and fielding such a new class of WMDs. ▲ 6. First world's reserve of Rare Earth Elements in the DPRK. ▲ 7. The U.S. will continue its beggar bowl's world tour, as long as it needs to import Rare Earth Elements (R.E.E. ), only to stay afloat in the A.I. race. ▲ 8. The Three Great Powers of the Next World Order: Pole Position for the DPRK in the A.I. race, opening the dawn of the Pax Coreana.